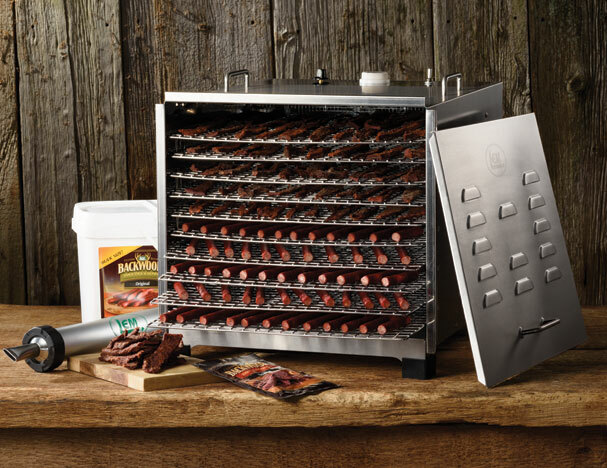 Food Dehydrators are used to preserve fruit, vegetables and meat after the harvest by removing moisture from food to aid in preservation - also called food drying. Use dehydrators to dry batches of mouthwatering jerky, apple chips, dried bananas and apricots for trail mix, or even various crafts, like making potpourri, apple head dolls, and paper. Its uses are endless! To dry food, a dehydrator needs to maintain a constant temperature and air flow. When shopping for a new dehydrator, keep these 4 important factors in mind: Heat & Air Flow, Access, Versatility, and Materials & Quality. Also, make sure your new dehydrator has a fan and a thermostat! Always remember that drying at a lower temperature for a longer period of time is BETTER than higher temperatures with shorter cooking times. High temperature causes the exterior of the product to form a shell and inhibits the interior of the product from drying. Make your favorite dried snacks at home without sacrificing quality or breaking the bank. Learn everything you need to know to get started drying fresh fruits, veggies, meats and herbs. LEM Staff Hints & Tips for Dehydrating. View our Food Drying Guide for Vegetables, Fruits, and Meat. USDA Jerky and Food Safety Fact Sheet.